What happens on a farm during the winter? Right now at S&S, much of our time is spent caring for the animals: our sheep, chickens, and dairy and meat cattle. Abby the dairy cow is milked twice every day. 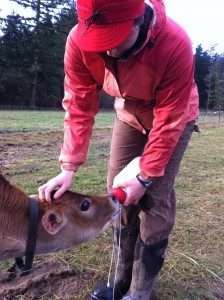 We keep most of the milk to consume ourselves or process into cheese and yogurt, but some is fed back to Abby’s two month-old calf, Embla. Milking Abby is a multi-step operation that begins with grooming and ends with decanting and processing what she produces. 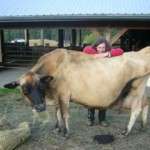 The milk Abby provides is essential to life on the farm, and so we try to honor and thank her by giving her extra love and care. We also need to ensure that her milk is collected and processed in such a manner that it can be shared with the public. The milking area is cleaned daily, as well as the room in the dairy kitchen where we decant and chill the milk. 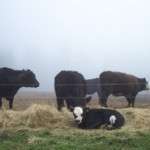 Our cow herds can be tough on pasture during a wet winter. In order to combat mud and evenly distribute manure, we rotate grazing areas and alternate where we feed hay. This means the cows are regularly on the move, shifting from paddock to paddock across the pasture. We use electric lines to delineate each paddock and keep the herd together in one area. Sigurd the bull spends time with both herds, depending on which cows are cycling at any given time. We monitor his behavior with the cows in order to know which of them might be pregnant and when we can expect a calf. This planning and observation is part of what makes winter special here, a time of latent growth and expectation. All of our ewes are currently pregnant, so, in addition to hay, we feed the sheep herd a mixture of grain and molasses to provide better nutrition for the lambs who will be born later this spring. Just like in the cow pastures, we try to distribute the manure and compaction that occurs in areas where the sheep eat by rotating where we place the hay. Pasture health is essential to ensuring that we can feed our animals from season to season without relying on outside food sources. 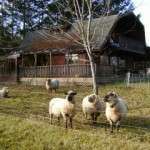 On a biodynamic farm like S&S Homestead, the farm is considered to be a whole, self-contained organism. This approach necessitates careful planning. To this effect, we recently went over the work plan for the entire coming year, discussing garden layouts, plans for the CSA, public workshops, animal reproduction, and the many other details that are part of life at S&S. Though most of the garden beds are resting right now, the farm is still full of energy and requires constant care. Each chore, even raking up uneaten hay or gathering fallen leaves, ensures the survival of the farm during this quiet, inward season.